In the interview below, Andrew Farrell, a Principal with the Human Resources Leadership Practice at HFA, talks with Debbie Shotwell, Chief People Officer at Saba Software, a company that provides cloud-based intelligent talent management solutions for organizations to hire, develop, engage, and inspire people worldwide. Throughout her more than 25-year career, Debbie has served in executive HR leadership positions at companies including BigCommerce, Good Technology, Pacific Pulmonary Services, Taleo, PeopleSoft, and AvalonBay. How did you become a CHRO? What were some of the critical moments in your journey to the C-Suite? I went to college to study business administration and human resources, and I entered the industry shortly after that. From the beginning of my career I knew that I wanted to one day be the head of HR, and my path to get here was very deliberate. What really helped me to reach the C-Suite was having the fortune to work with leaders and peers who trusted my ability to grow and gave me ample opportunities to do so. So, I made sure to capitalize on those opportunities. I worked on complex M&A projects, challenged myself to lead very large teams, and delivered results. Along the way, I adopted a more “hands-off” leadership style. My team members have been largely self-directed, but we are all focused on the same set of goals, and we’re all held accountable to achieve them. The people within any organization are the most important assets, and that understanding has gotten me to where I am today. Although I’ve reached the C-Suite, I’ve never stopped learning or growing. As the industry evolves, I look forward to the continuation of my journey. What advice would you give to other women that aspire to hold C-Level roles? For anyone seeking a C-Level role, but particularly for women, it’s important to be brave and to take chances. Don’t shy away from projects if you think you’re too busy or avoid travel because it’s challenging to manage. Say yes! Don’t just work hard though, be loud. Make sure that your voice is heard and that you speak up when you are delivering results. Let go of administrative tasks and focus on where you can add strategic value – do what’s best for the organization. And, as you reach new levels of your career, bring others along with you. Mentor them, teach them, guide them, and share your success with them. What do the best leaders do that sets them apart? Working in HR, I’ve seen firsthand what makes someone successful in a leadership role, and it’s multi-faceted. Broadly, good leaders are humble, kind, patient, and calm. They don’t foster drama or seek attention; rather, they speak the truth and demonstrate high levels of self-control and emotional intelligence. Self-awareness is also key, and the ability to make your courage larger than your fear. Being a leader also has a lot to do with how you treat others. Instill trust in your team and your peers and give them the chance to be seen and heard. Display empathy and understand when it’s appropriate and necessary to take a step back to listen and learn. I would also say that a good leader lives the values of their organization. It’s more important today than ever before that a leader does what they say they will do and follows an ethical and moral code. How can someone become a CHRO? What skills do they need to develop? To become a CHRO, you must understand the dynamics of talent acquisition and the current market – and the market is always changing, so you need to stay up-to-date. You need to have a point of view on how to develop the skills of your leaders and managers, as well as how to build development opportunities for individual employees. A solid understanding of total rewards, compensation, and benefits is required too. Most importantly, you need to have mindfulness training, which is a fairly new practice that helps to reduce the root causes of stress that team members may feel. A good CHRO makes it personal to care about the employees in their company and their overall wellness, helping them to thrive. You can adapt that mentality at any level of an organization and carry it with you as you advance. But, HR isn’t just about people management. The best CHROs have a comprehensive understanding of financial planning, business forecasting, systems and process design, and the key drivers of growth in their business. Many CHROs are responsible for managing a diverse, potentially global, workforce. If you want to become an HR leader, I recommend living and working overseas or getting exposure through global projects. This will benefit you greatly in the future as you seek out new opportunities. What are some of the best practices of the top CHROs? A top CHRO is capable of working at various levels of an organization, engaging with employees, senior leadership, and the board. When it comes to ethical issues or gray areas, you must have the courage and the confidence to address it with your peers or the board, as appropriate. I also can’t overstate the importance of a strong business and financial acumen. Understand how the company works from top to bottom, including how profits are made, so that you can develop the best talent strategies and collaborate closely with stakeholders from across the organization. The best CHROs I know also think and act globally, and they took concerted efforts to expose themselves to global projects early on and throughout their careers. How should CHRO success be measured? Don’t be afraid to set goals and measure against them! This type of tracking enables you to demonstrate your success. The entire C-Suite should largely be tracking against revenue and growth rates of the business. What development/trends in the labor market do you see going on today that CHROs need to address? The old way of doing business (brick and mortar) is gone. Organizations with the right technology can now empower a remote workforce, which provides access to a wider scope of talent, allowing them to “go where the talent lives.” It also allows companies to put greater focus on the business instead of a physical space. This drives higher engagement and also promotes retention, given that employees can remain on the team if they move or a spouse is transferred. These employees can really grow within the organization and can then take a greater role in teaching others about the organization’s culture as new talent is recruited. With a remote workforce, organizations will need to really focus on retaining talent. A long tenure within a company doesn’t equate to retention. Develop the talent you have and enable them to grow to promote true retention. Leadership should also encourage more live meetings and video meetings – and less emails – to promote engagement. Aside from that, artificial intelligence will continue to play a huge role in the HR and people data space, and CHROs will be challenged to embed AI solutions into the workforce and show their quantitative ROI. How do you see the CHRO function evolving over the next three-to-five years? Over time, HR will need to become a profit center, not a cost center. That will be easier for companies in the HR tech space, as HR can help to sell software solutions that solve people problems and serve as real customer success stories. But regardless of the industry, CHROs will need to demonstrate that they contribute to a company’s overall growth. In the near future, it’s likely that CHROs will be responsible for the lifecycle of the entire organization and will work very closely with the CEO to evaluate people, systems, and processes and bring new learning and innovation into an organization. In the boardroom, the CHRO will continue to keep members informed but will also help to ensure that decision making is carried out with a new focus on people data and analytics and outcomes related to the success of the organization, not just the shareholder. What are you currently working on at Saba? Today, we’re putting employees in the driver’s seat of their own development and performance. We’re not only helping our customers become true talent development organizations, we’re modeling the way forward ourselves. We’re helping our customers solve tremendous challenges around skills shortages in the market by giving them the tools and best practices and platform needed to teach employees valuable soft and technical skills and to help them perform at their highest level possible. As an HR professional, watching the transformation happen is incredibly gratifying! We call it drinking our own champagne at Saba! We appreciate Debbie taking the time to share her insight and experience with us. If your company is seeking a top-performing CHRO, reach out to Andrew Farrell at 403.374.0580 or andrew.farrell@hfischer.com. 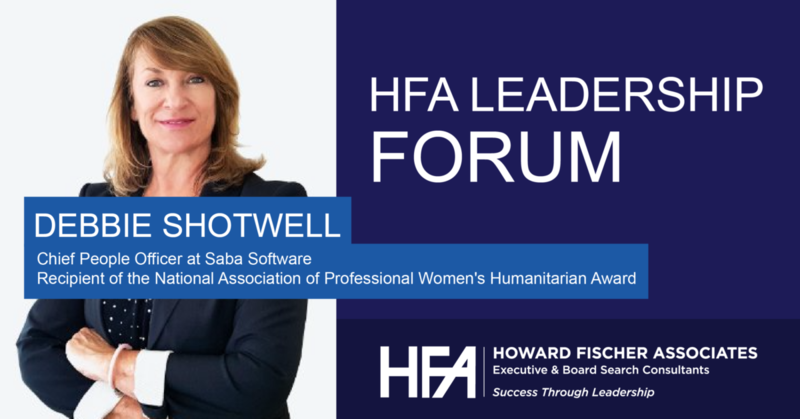 As the Chief People Officer of Saba Software, Debbie Shotwell is responsible for human resources, learning and development, employee communications, and community relations. Ms. Shotwell brings more than 25 years of passion and experience building high-performance teams and cultures that deliver results. She is a Certified Compensation Professional (CCP), a member of the Society for Human Resources Management (SHRM), and has been featured on Inc.com, Forbes.com, and the SHRM blog. She’s the recipient of the National Association of Professional Women’s Humanitarian Award, and she has served on the Board of Directors of Pleasanton Partners in Education and 101 Best and Brightest. Before joining Saba, Ms. Shotwell was the Senior Vice President of People and Culture at BigCommerce, where she built an innovative learning and development function that supported employee, leadership, and strategic partner training. Her success in this capacity led to BigCommerce being recognized as one of San Francisco Bay Area’s Best and Brightest Companies to Work For, one of Austin’s Top Workplaces, and one of the Best Places to Work in Australia. Prior to her work at BigCommerce, Ms. Shotwell was Chief People Officer at Good Technology, where she implemented talent programs that increased employee engagement and reduced turnover. Additionally, she has held executive HR leadership positions at Pacific Pulmonary Services, Taleo, PeopleSoft, and AvalonBay. Ms. Shotwell earned a Bachelor of Science in Business Administration/Human Resources from California State University, Sacramento.